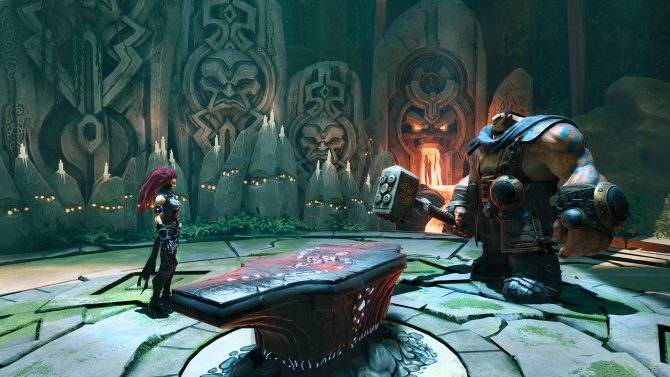 Darksiders III strays too far away from the formula that made the first two entries great while also being mired by bugs and performance issues. I’ve been evangelizing to friends and colleagues who haven’t played the Darksiders series in anticipation of Darksiders III. The action franchise that saw its first installment release back in 2010 was incredibly under-the-radar when it hit store shelves, and despite it having many commonalities with other more notable franchises, it did a lot of cool things on its own that made it unique. Two years later in 2012, Darksiders II released and continued to borrow new elements from other popular games while still making those mechanics and systems feel original. It was another fantastic game, in my opinion, and I couldn’t wait to see what the series did next. 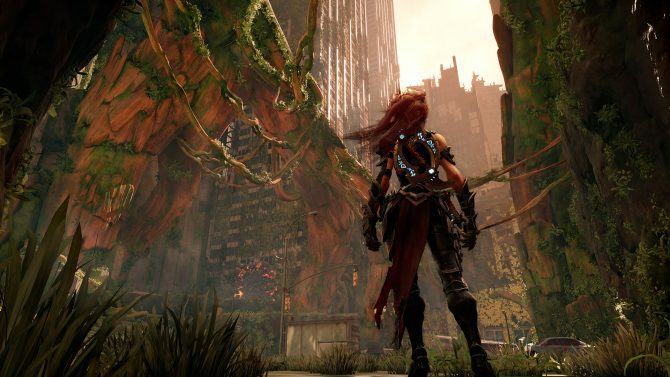 While it took a little over six years to get here, Darksiders III has finally arrived despite having to overcome a variety of obstacles along the way. Unfortunately, the result is nothing that I hoped it would be. Poor combat, an uninteresting story, and a litany of performance issues linger throughout Darksiders III, making it easily the worst entry in the trilogy so far and even worse, just a bland action RPG. 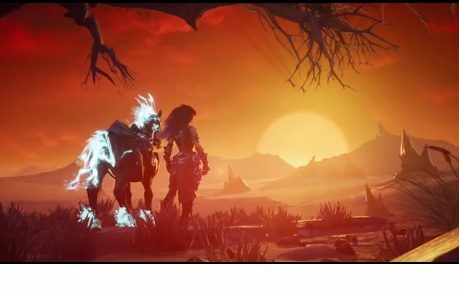 This time around Darksiders III places you in the role of the lone female of the Four Horsemen: Fury. Set during the 100-year imprisonment of fellow Horseman and Darksiders protagonist War, Fury sets off to Earth to unravel the mystery surrounding War’s situation while in the process, defeating the Seven Deadly Sins which in the world of Darksiders take physical forms. Throughout Fury’s journey, you’ll travel across the globe to take down each Deadly Sin while further learning more about just what’s going on in the expanded world. Overall, we’ve reached a point with the Darksiders series where I’m just kind of tired of seeing each Horseman’s view of what happened in the fallout of the Apocalypse. Maybe it’s derivative to criticize the story of Darksiders III for what it isn’t rather than what it is, this series is nearly a decade old and I still don’t feel like it has ever expanded upon the story in many meaningful ways, which is a shame. As for some actual criticism about the story at hand in Darksiders III, I just didn’t find it all that compelling. Fury’s story doesn’t feel like it plays much into the larger narrative that is being told and is instead more about her personal growth. This works well at times, and there are a few good character moments throughout with Fury. On the whole, though, I just found the story to be rather one-note without much deviation from the larger focus of “kill the Seven Deadly Sins” throughout its fifteen or so hour runtime. It was mostly just hard for me to remain interested throughout the entire adventure. Now, I can tolerate a bland video game story. Heck, most video games stories aren’t all that fantastic in the first place. Where I did have higher expectations for Darksiders III was in the realm of gameplay and compared to the first two games in the series, I was sorely disappointed. 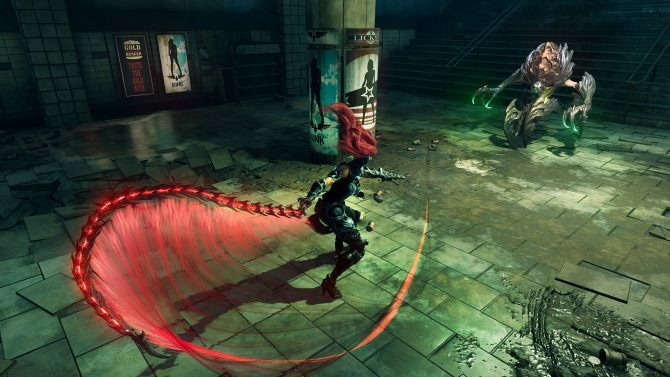 Fury’s primary weapon of choice is a whip, which will be the main item that you use to dispatch hundreds of enemies throughout Darksiders III. It was a weapon I was excited to use when I first booted up the game, but after a few hours into the experience, it quickly felt like I had seen all it had to offer. This is a more significant problem with Darksiders III’s combat as a whole in that it’s just mundane. I’d say more than 90% of the combat encounters that I had in Darksiders III boiled down to me merely smashing X repeatedly until my opponents were dead. This can be a more significant issue in many action games from time to time, but I really felt like Darksiders III never really encouraged you to use other weapons at your disposal or to mix up your combo sequences. Combat does still have a satisfying feel to it, but it’s just not engaging in the slightest. I also just generally found that Fury didn’t feel great to control, mainly due to her sluggish movement. The Darksiders games have always had faster-paced combat, but in this third entry, things are slowed down somewhat. Fury can also utilize a dodge roll, a move that is very important to master if you want to make later boss fights much easier, but something about the roll always felt off. I think the window for invulnerability was still a bit off compared to when you pressed the button. 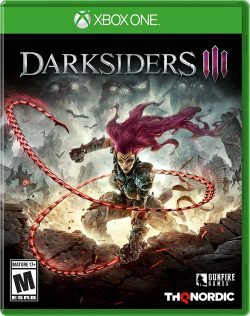 As a whole, Gunfire Games seemed to change many of these elements mentioned above of Darksiders III up compared to previous entries to more reflect one of gaming’s most popular action franchises: Dark Souls. Yes, even Dark Souls has now invaded the Darksiders franchise. 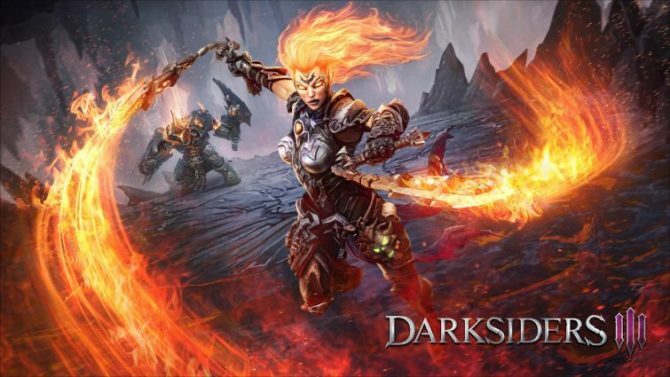 While in the past I found that the Darksiders series was able to make many original elements from other franchises that would be brought in, the Dark Souls portions of Darksiders III that have been incorporated don’t feel meaningful. Not only has combat been made more to reflect the pace of Souls-likes, but the leveling system has also now been altered to reflect it as well. Every enemy you slay in Darksiders III will drop souls which you can then use to level up your health, strength, or arcane abilities. The level progression is nearly identical to that from most Souls games, which isn’t necessarily an awful thing. There’s a reason why action games of this ilk are so popular in the first place. I think more than anything though I’m just disappointed that Darksiders III opted to dupe the Souls formula in the first place. The increased difficulty that comes with implementing this style of action game doesn’t feel right in a Darksiders game. I appreciate the challenge that is usually found in Souls games, but randomly seeing the Darksiders series hit a strange, difficult spike by the third entry is odd. Gunfire Games didn’t do enough to adapt this formula and make it their own, and in the end, it just feels like the Souls elements were thrown in only for the heck of it. As for some more positive notes, I generally did like most of the locations with which you find yourself throughout the story. There are some standout locations in particular, with one underwater portion of the game surprisingly bucking the hate usually seen with water-based levels. Most of the areas in Darksiders III have a cool vibe or look to them. I also appreciated how much smaller in scale the world was this time around, especially compared to the vast areas in Darksiders II that became a chore to travel through. Even though the smaller, more intimate setting it more appreciated though, I hated that there was no map to utilize in the game. This is, again, another element similar to that of Souls games that I feel like Gunfire Games tried to run with, but I found it to be incredibly frustrating to have nothing to reference. 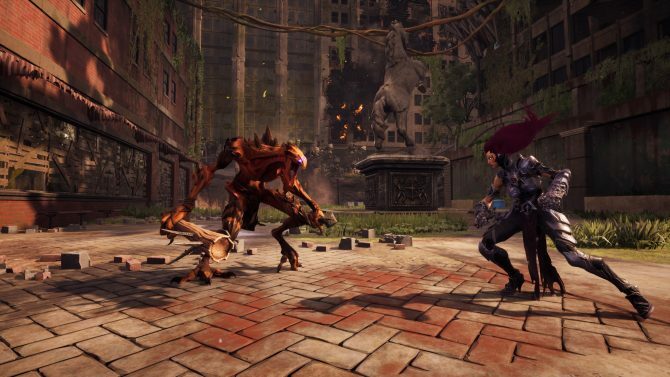 While Darksiders III does have some of the DNA of a Souls game, it also is combined with that of a Metroidvania, a genre where maps are often essential to know where you’re at and where you’ve been. It’s such a small ask, but being able to more easily understand where I was at in the world at any time would have been appreciated. One thing that I do continue to love in Darksiders III is the fantastic character design that is seen throughout. The series as a whole has always had a really unique art direction, and that is seen here as well. The Seven Deadly Sins, in particular, have some really cool designs that vary greatly. Despite many of my issues with Darksiders III, being in this world and interacting with its many characters once again reminded me why I think it’s so unique and fun in the first place. Above all other issues that I have with Darksiders III, however, the most egregious is that of the game’s performance issues. If you name any common problem that can sometimes be found in a video game, there’s a great chance that that issue exists in Darksiders III. Worst of all is that the game chugged continually throughout my entire playthrough to the point that struggled to consistently hit 30 frames per second. It’s also worth noting that I played on an Xbox One X and still found these problems to be commonplace. Furthermore, Darksiders III crashed on me entirely somewhere close to five different times throughout my playthrough to the point that I eventually just contemplated quitting entirely. Plus, the game has a ton of issues with loading. Not only are load times themselves longer than they have any right to be, often you’ll find yourself running through an area only for the game to drastically stop while it loads in the next area you’re about to enter into. I seriously have at like another five or six mentionable bugs or performance problems that I could mention in this review, but I won’t bother to take up your time. Long story short, it’s highly disappointing that Darksiders III released in this manner and it feels like it was rushed out the door by THQ Nordic. If this is their standard for the litany of other IP that they currently own, then it’s not going to be pleasant. 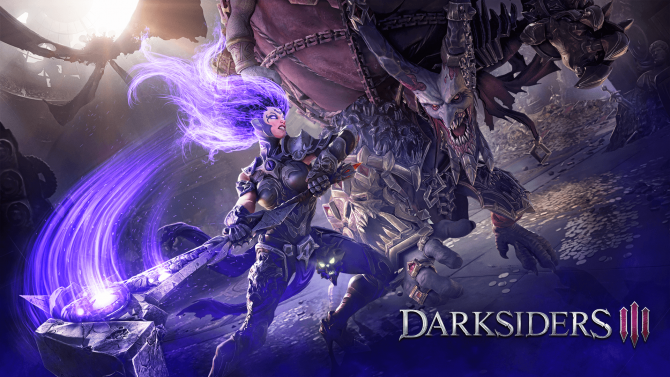 In short, Darksiders III is not the game that I hoped it would be when it was first revealed. While I have long loved this series, the third entry is an underwhelming, buggy mess that doesn’t stand anywhere close to the greatness that was found in the first two installments. 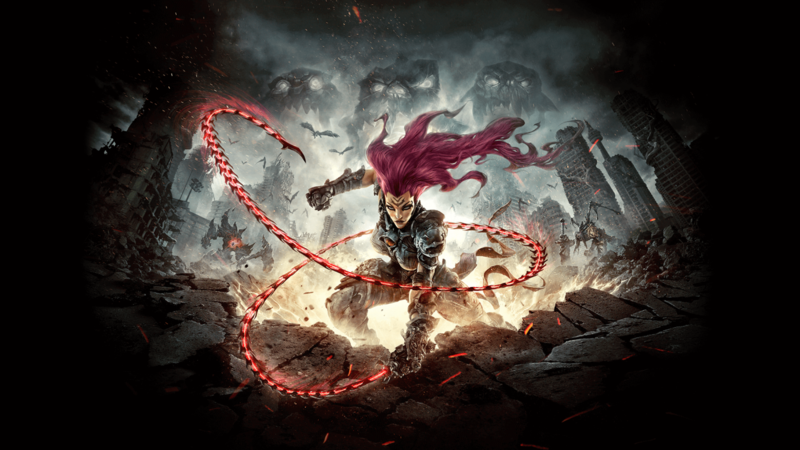 Deep down, I still want Gunfire Games and THQ Nordic to give this franchise one more shot, but if a subsequent entry were to once again turn out as Darksiders III has, I’d just prefer if this now just be the series’ final breath. 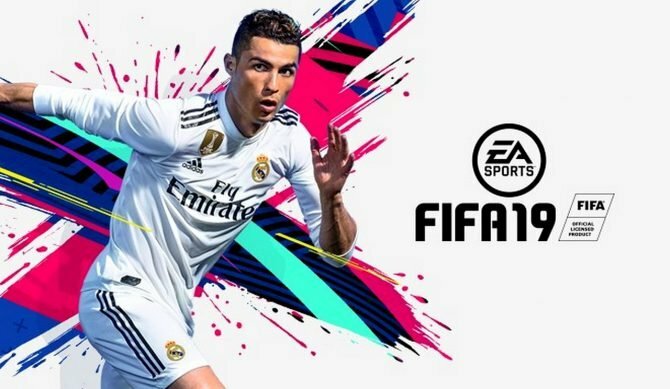 FIFA 19 has once again taken the UK's top sales spot, with the week's newest release of Darksiders III having a very poor start to its lifespan.